Bio Notes: Henry Francis Kerr was born in Edinburgh on 15 February 1855, the son of Andrew Armstrong Kerr, banker, 4 Broughton Place, and was educated at Hunter's School and thereafter at Edinburgh Academy from 1866 to 1871 and at Edinburgh University from 1871 to 1872. In the following year he was articled to Pilkington & Bell, and he remained with Pilkington as a draughtsman until 1878, continuing to attend classes at the University of Edinburgh and the Government School of Design. In 1879 he obtained a place in the office of John Lamb Murray of Biggar where he seems to have remained until commencing practice on his own account in Edinburgh in 1881, initially from his parents' house in Broughton Place. In 1889 he passed the qualifying exam and was admitted ARIBA his proposers being Rowand Anderson, John Slater and Arthur Cates. By this time he had made various sketching tours in Scotland and while in London to Norwich and Newcastle. Kerr had Fife connections and for many years a second residence at St Colm's, Inverkeithing. He was a prominent antiquary and architectural historian and published extensively in the 'RIAS Quarterly', 'The Proceedings of the Society of Antiquaries' and the 'Transactions of the Scottish Ecclesiological Society', and in the 'Book of the Old Edinburgh Club'. 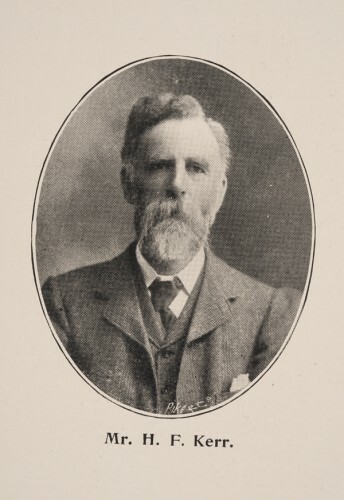 He was elected to the Parish Council in 1898, was a member of the Board of Managers of the Royal Edinburgh Asylum and was President of the Edinburgh Architectural Association in 1900. During World War I Kerr took charge of the practice of Alexander Hunter Crawford and Henry Rochead Williamson and ran it from his home at 12 East Claremont Street: Crawford at this time was in Liverpool overseeing the rebuilding of the Fairfield Biscuit Works and Williamson was on active service. Kerr had previously shared Crawford & Williamson's office at 10 Randolph, perhaps with the intention of merging the practices. Kerr died at his daughter's house at 12 East Claremont Street, Edinburgh on 2 November 1946 where he had lived after the death of his wife but his daughter also predeceased him. 1896 Edenholme Dunbar East Lothian Scotland Gabled extension on west - for dark room, pantry, bathroom etc. 1918(?) Hutton Parish Church and Churchyard Hutton Berwickshire Scotland May have instructed Scott Morton & Co on further interior work?